Many people are inclined to simply buy a book, magazine or the latest DVD, go to trade shows or join a local woodturning club to watch demonstrators turn and pick up a few hints and tips. All of these are valuable sources of information but none is a replacement for actually doing it yourself. There is a very thin line between achieving a good cut with a gouge and not getting a cut at all - or worse - getting that infernal catch. A very slight rotation of the tool or lifting or swerving the handle will make all the difference and these subtle movements do not always come across in a book, DVDs, and the like. I think by far the best way of learning any new skill is to spend time practising in front of a skilled practitioner who is capable of passing that skill on. 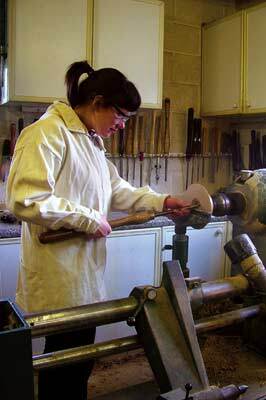 If you really want your woodturning to dramatically improve I can definitely recommend going on a course. There are numerous websites available which can help when you are researching courses and tuition. These are a good place to start and will point you in the direction of many proficient tutors. Another important aspect to ascertain before you start the course is what the price entails. Don't be shy about asking this question, as it is important to assess your options beforehand. Tutors should also be willing to share this information with you. Another thing to find out is whether your tutor is insured, as this is a sure sign that your tutor takes their courses more seriously, rather than a 'casual' tutor. Again, this is another important question to ask before choosing which tutor is the one for you. Mark sent me to Devon to undergo a two-day beginner course with Colin Simpson. I did have some initial reservations about what the course would entail and I was very nervous about actually trying some turning for myself. Unfortunately, professional turners, in both person and on DVDs, have the annoying skill of making turning looking easy, but as I was to find out - it's actually not - but it is a lot of fun. Before we started any turning, Colin discussed with me what the course would entail and asked what my expectations were from the two days. I explained that I would like to understand the basics of turning, like chucking, what tools are used for what, why they are used for that reason etc. Colin also took me through the basics of safety - the need to be safe whilst turning, i.e. hair tied back, turning smock, safety glasses etc. - and then it was on to the lathe. We also discussed the various safety measures you need to take before switching the lathe on and lathe speed. We then discussed what my first project would be and Colin showed me the various chucking and holding methods available and in which situations each could be used. During this time I was also handed a set of comprehensive course notes which I could refer to during the day and which would also act as an aide-memoire after the course. It was then onto a practical session of bowl turning. I was given a blank from a tree of heaven (Ailanthus altissima). I found the centre with a centre finder and then fixed a faceplate to it and mounted it on the lathe. We then looked at the tools I would be using to turn my bowl, and I was pleased that I was able to correctly identify the bowl gouge! Colin explained the various types of grind and the use of a grind where the wings are ground back a little, allowing it to be used on the pull and push cut. We also covered in what circumstances each should be used. I must admit that this didn't make much sense to me, so we decided to put the cuts into practice. One thing that I really didn't understand was the importance of stance when turning. I was told how it is important to relax into each cut I made. As I was quite nervous this didn't come naturally and I had a tendency to grip the tool too tightly, resulting in white knuckles. Also, rather than rotating my body, I tended to move, therefore moving the tool and upsetting the cut. It took me a long time to become confident in the cut I was making, but my favourite had to be the pull cut using the bowl gouge. I made the initial cuts into the blank but I kept getting catches due to the fact I was not presenting the tool to the wood properly. I was shown how to make the cuts safely and each time it got a little easier, but I guess I, like many, experience this. I am assured it will take a while to become proficient with cutting. I also learned the importance of cutting the wood in the right direction for the cleanest cuts and more control. 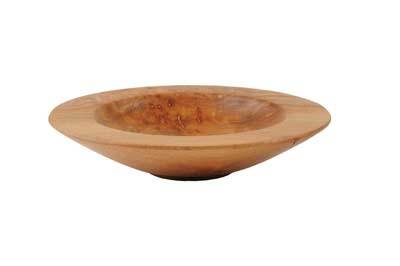 A scraper was used to refine the piece and the parting tool was used to create the spigot for the bowl. Colin continually assessed my progress and corrected my stance or tool presentation when it was not quite right. I found myself getting quite frustrated as I kept experiencing dig ins, but it was great to have someone on hand to reassure you that you're making good progress. Unfortunately, during the turning I did experience some tear out and we also had to clean up some spirals. This was a bit disheartening, but I was assured that, with practice, the cuts would be cleaner. I was also glad to hear that many other people experience tear out at some stage or other and this is where sandpaper is a very good tool for cleaning things up. I didn't like the thought of power sanding as I am a little scared of power tools, so it was back to hand sanding. Colin showed me how to sand in the correct position - between 6 and 9 oâ€™clock - on the bowl, otherwise your hand could get thrown down by the spinning lathe. All blemishes were removed with the coarsest grit and we went through the grades from 120-400. I was told the importance of extraction, both at source and ambient, and I wore a dust mask. Cellulose sanding sealer was then applied liberally before de-nibbing with wire wool. 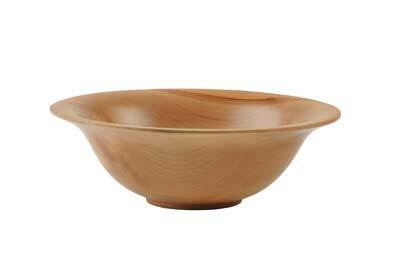 I then gave the outside of the bowl a coat of paste wax and buffed it with a paper towel. Now the inside had to be turned. Again, the bowl gouge was used for this and timber was removed from the centre. I was now beginning to get used to how to hold the tool and was relaxing more. I was getting more confident and, most importantly, I was enjoying myself and was taking real pride in the shape I had created. It was a case of adjustment, refinement of stance, cut and process, so that I could become more proficient and confident. The inside was turned, sanded and sealed as per the outside and then the spigot removed whilst held in a vacuum chuck. 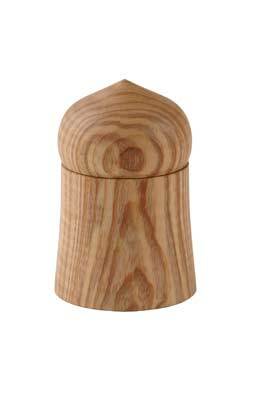 Colin explained that today we would be tackling spindle turning and we agreed that I would be turning a box from end-grain ash (Fraxinus excelsior). Colin explained that spindle, or between centres turning, involves the roughing down of stock from square or a cut uneven log/branch to round - something that initially scared me. I didn't like the thought of putting a tool into a spinning piece of square or uneven timber! But as always, gentle reminders of the process of how to mount the work, what tools to use, how to hold them, and how to cut the wood cleanly helped no end. Colin explained how we had to 'knock the corners off' the timber, always going off the wood. I had to initially present the bevel to the wood before I went into a cut, but I struggled with this a lot. I was scared to get my fingers too close to the toolrest and the spinning wood and therefore my stance was very rigid. I also found it difficult to rotate the tool and to find a cut; often I would find a cut and lose it again. I required a lot of assistance here but Colin was incredibly patient with me and kept reiterating what was going wrong and how we could fix it. After much help and assistance, I eventually roughed the square blank down to round, which was very satisfying. The rest of the day was spent making a box and going through the various cuts, tools used, and how to get the lid to fit. I was definitely more confident on the second day, and I think much of it was down to the patience of the tutor and a better understanding of how to stand, make a cut and, of course, relax. It was hard work, and although I got frustrated at times, I knew I was in safe hands and would be OK. I found making a box harder than making the bowl, which was fun, but a little frustrating, as I was grappling with cutting wood correctly and looking at the shape and using tools that I had only ever read about before. I then made another bowl from wych elm (Ailanthus altissima), which I found a lot easier the second time. I had a great time and I learnt a huge amount over the two-day period. The course notes will come in very handy, as I will be able to refer back to these and recap on what I was taught. There is no way I would remember everything covered otherwise. I understand more about how and why cuts are done a certain way and have a better sense of the sequence of making something. I would definitely recommend professional instruction and can see that it holds many benefits over just watching a DVD, or reading a book. Having someone there to help, guide and encourage you really does make all the difference. 2. Also, discuss your expectations prior to commencing the course - are there any areas you want to focus on etc. 4. 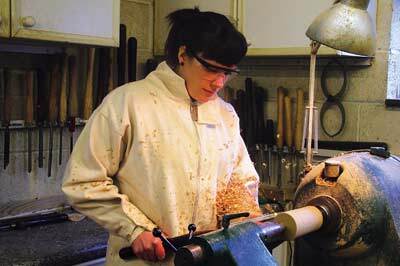 When researching tuition find out how many other students will be on the course, how much time you will spend at the lathe, rather than just watching the tutor turn. Get reference from past students etc.